Governor Arnold Schwarzenegger of California has signed an executive order to sack 22,000 state workers and put 200,000 on the minimum wage. The most populous state in the US faces a budget deficit of more than $15bn (£7.6bn), and legislators are struggling to agree a spending plan. Mr Schwarzenegger says the cuts will save $100m a month and put pressure on politicians reach a budget deal. But a leading official in the state challenged the decision to cut pay. Opponents said there was enough cash to pay full salaries and the state's financial controller, John Chiang, vowed to ignore Mr Schwarzenegger's order. California has one of the largest economies in the world but the governor says it currently has no way to pay contractors for many of the services it provides. Mr Schwarzenegger, the former Hollywood film star turned Republican politician, told reporters he had signed an executive order on the staff and pay cuts. Most of those laid off are seasonal and part-time staff, while the 200,000 remaining state employees would have their full salaries restored when a budget was agreed, the governor said. "Today I am exercising my executive authority to avoid a full-blown crisis and keep our state moving forward," he said. "This is not an action I take lightly but we do not have a budget and, as governor, I have a responsibility to make sure our state has enough money to pay its bills." Mr Chiang, a Democrat serving as financial controller, has vowed not to implement the pay cuts, saying to do so could risk legal action. He sent a letter to Mr Schwarzenegger on Thursday saying he would defy the order and issue employees their regular salaries. The governor's executive order, he said, was based on "faulty legal and factual premises". 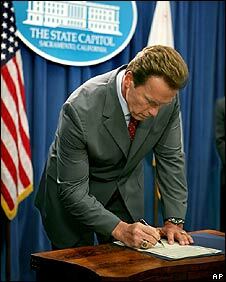 Workers and union representatives were quick to point out the human cost of Mr Schwarzenegger's move. "People are going to get put out of their homes. The governor says he's sorry. We can't pay with sorry," Debra Martin, a union official, told the Los Angeles Times. The dispute between the governor and the financial controller centres on the interpretation of a five-year-old state Supreme Court ruling. "If that's what it takes. I'm here to make sure that our state functions, and whatever it takes, I will do it." Some 30 American states face budget deficits, caused by rising costs and falling revenues in a slumping economy, but California is by far the largest.